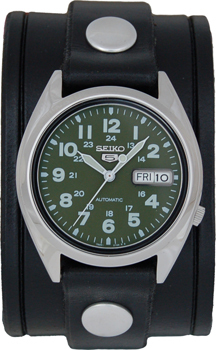 Seiko watch is an automatic watch that has no battery, self winding mechanical movement winds from the motion of your wrist, no batteries to change. Rapid date and day change. Day counter can be displayed in Spanish or English. Green military watch dial with lumibrite glow in the dark hands and markers. 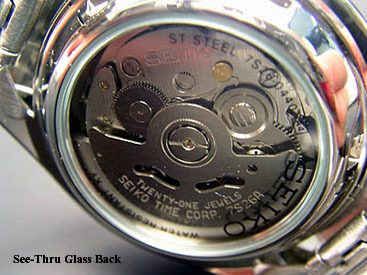 Watch housing is water resistant to 30 meters and has a see-thru glass back. Wrist size and leather color options can be selected at the very bottom of the webpage. Our unique handcrafted cuff watch bands are all made with genuine leather.